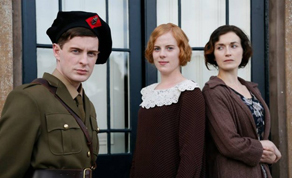 Irish independent feature film ‘A Nightingale Falling’, the period drama set during the War of Independence, will have its Irish television premiere this Easter Sunday at 10pm on UTV Ireland. The film is based on the novel by Clare author PJ Curtis and was released in cinemas last September where it enjoyed a six week nationwide run at the Irish box office. Following its premiere at the Galway Film Fleadh the film went on to win Best Film at the Sky Road Film Festival, Best Feature at the Underground Film Festival, and recently picked up an award for Best Drama Score of 2014 at the Reel Music Awards. TV audiences will also get a chance to see ‘The Making of A Nightingale Falling’ in a special documentary which looks at the community involvement in County Offaly. It focuses on the ways and means the filmmakers managed to produce the film and the efforts undertaken by everyone involved, including the recording of the score with the Ulster Orchestra for their very first film score. The film was co-directed/produced by Garret Daly and Martina McGlynn alongside producers Gerry Burke and PJ Curtis. ‘A Nightingale Falling’ is a Mixed Bag Media production in association with Northern Ireland Screen. ‘A Nightingale Falling’ will have its Irish TV premiere on UTV Ireland, Easter Sunday, 5th April at 10pm. ‘The Making of A Nightingale Falling’, will be broadcast on the same day 4.30pm.